Nearly every product imaginable, from Band-Aids to KitchenAid mixers, is now available in pink, and Americans are constantly encouraged to buy these items to support the fight against breast cancer. So why is a Christian bookstore furiously pulling pink Bibles from its shelves? Because they raise money for the Susan G. Komen Foundation, which in turn funds Planned Parenthood's breast cancer programs. In all cases, Komen funding is used exclusively to provide breast cancer programs, including clinical breast exams conducted by trained medical personnel. It's important to note that Komen will only make grants to non-profit organizations. As many mammography providers are for-profit entities, we are only to fund mammography services through grants made to local non-profit service providers. According to The Nashville Tennessean, in the past five years, money provided by Komen allowed Planned Parenthood to perform 139,000 breast exams and 5,000 mammograms, which detected 177 cases of cancer. This is a specific example of the women's health services provided by Planned Parenthood that have absolutely nothing to do with abortion. However, according to conservatives logic, the money Planned Parenthood takes from Komen is only freeing up funds for its nefarious abortion plot, so no money should go to the organization. This week LifeWay Christian Bookstores announced it's removing the Bible from its shelves, saying, "Though we have assurances that Komen's funds are used only for breast cancer screening and awareness, it is not in keeping with LifeWay's core values to have even an indirect relationship with Planned Parenthood." 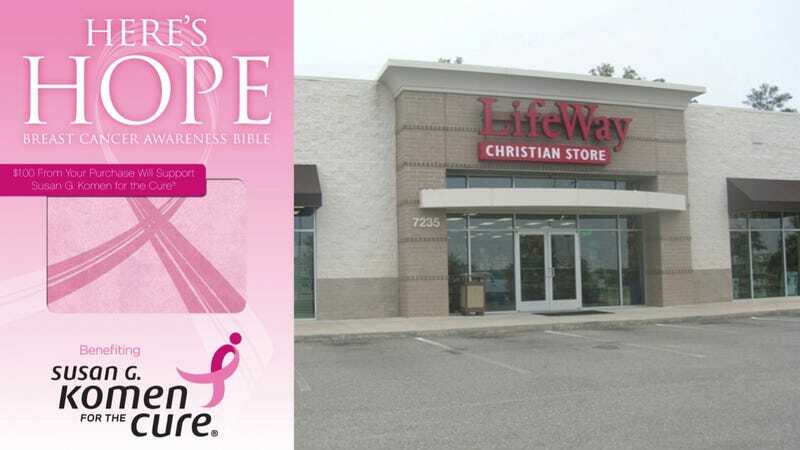 Komen said in a statement that it's disappointed by LifeWay's decision because they money from the Bible sales would all be used to fund breast cancer programs, and LifeWay had pledged to donate $25,000. Komen has also said that it won't cut its ties to Planned Parenthood because they're committed to giving underpriviledged communities access to healthcare and, "will fund the facilities that can best meet those needs." LifeWay certainly has every right to recall the Bibles, but it's sad that depriving Planned Parenthood of money that won't even fund abortions is more important to the store than seeing more women get breast cancer screenings.